Prior to this week, 66 kilograms was primarily centered around two athletes — Ellis Coleman (Army/WCAP) and two-time World Team Trials finalist Alex Sancho (NYAC-OTS). There’s some history there. Not a ton, but enough recently to where it is relevant, particularly if you put an emphasis on the last 12 months. Sancho defeated Coleman for third place and the National Team spot at the 2016 Olympic Trials. 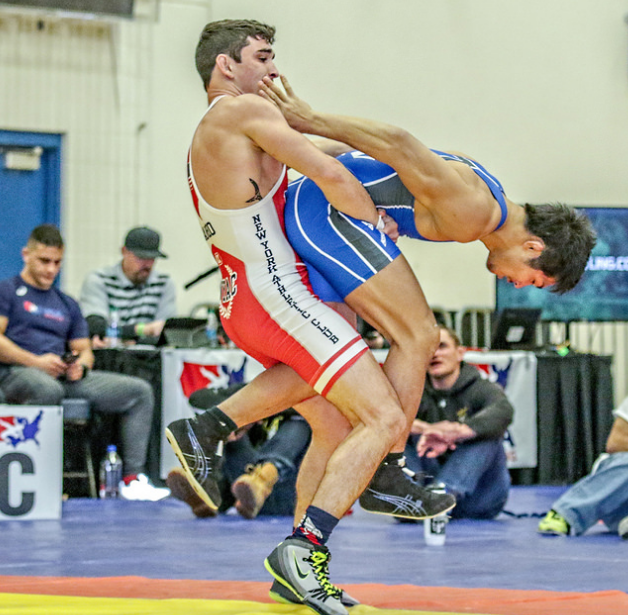 Then in November’s Non-Olympic World Team Trials, Sancho ran over Coleman on the strength of a surprising technical fall in the semifinals. But the last time these two met, the tension between the duo was ratcheted up a notch. In what was a tightly-contested National final in December, Coleman earned the win in controversial fashion when he was the recipient of a passivity point late in the second period. Believing there was no call, Sancho assumed he was the winner. He was wrong. Confusion stole the spotlight and it was a 2-2 criteria loss for the Miami product. This event might be about making the World Team, but it’s likely Sancho also wouldn’t mind grabbing some vengeance tomorrow. However — another top contender has entered the fold at 66 kilos: one Jesse Thielke (NYAC). The Olympic Team representative last year at 59 kilograms was originally presumed to be at the sport’s lowest weight this weekend. Plans apparently changed. By most accounts, Thielke struggled on and off with making 59, so the switch makes sense right now. Plus, he has some credible experience at 66, including a bronze there both at the 2015 US Nationals and the 2016 Grand Prix Zagreb Open. Everyone knows about Coleman by now. At (still) only 25 years of age, he has long been considered one of the most capable and gifted Greco athletes in the country. He was an age-group stud before he became a Senior, pulling down National championships as a Cadet and a Junior. Eventually, Coleman earned two Junior World bronze medals, which nicely set the stage for his emerging career at the next level. In 2012, Coleman made good on all of the hype by locking down a spot on the Olympic Team. The win over Sancho gave Coleman his third Open title and following that chaos, he got back to work fairly quickly. He went 3-0 at the Armed Forces Championships, which wasn’t a shocker. A week later, Coleman found himself going up against decidedly stiffer competition at the Thor Masters Invitational in Denmark. There was some importance here. Given the expectations that perhaps unfairly coincide with each of his performances, Coleman can sometimes be a frustrating watch, and it’s only because you know he can do so much more than what you’re seeing. In Denmark, the only thing frustrating about Coleman was the fact he was forced to bow out after putting together a 4-0 run and headed towards a medal. After notching three wins on the day, Coleman faced off with 2014 World bronze medalist Edgaras Venckaitis (LTU). It was actually the second time they met — in 2013, Coleman was defeated by Venckaitis at the Jacob Curby Cup. This wasn’t a repeat. Coleman was aggressive, agile, and tactical in turning back the hotheaded Venckaitis, but it was also what led to a problem. Knowing he was going to lose, Venckaitis purposely wrenched Coleman’s shoulder coming off of a break. When the bout was over, despite the win and the success he was having at the event, Coleman withdrew for precautionary reasons. Thankfully, that was over a month and a half ago and the word is he is just fine heading into the Trials. Not to be outdone, Sancho has also stayed right on track. 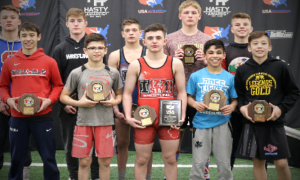 In February, it was a silver for the second year in a row at the Dave Schultz Memorial. A month later came a high rate of activity. At the Thor Masters in Denmark, 66 was sidestepped in favor of 71 and he got his money’s worth. Sancho wrestled six matches that day going 4-2, his second blemish a gripping 6-6 criteria loss to Patrick Smith (Minnesota Storm) in the third place bout. The next week was the Grand Prix Zagreb Open in Croatia and it was there Sancho really made a statement. A semifinal win over Mate Nemes (SRB) which at one point saw Sancho essentially pull Nemes over the top by grabbing his shoulders for four points showed just how in-the-moment he can be. He then punched it all the way through with a thrilling victory over Mihai Mihut (ROU) to earn his first overseas gold medal. 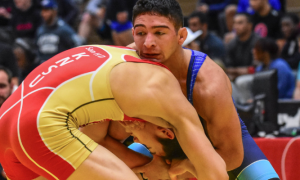 While Sancho is without a doubt as much of an established presence nationally as practically everyone else competing this weekend, he has flown a little under the radar at times for the masses. That is going to change, be it imminently or soon down the road. Yes, he is strong, but it’s Greco — they’re all strong. Where Sancho stands out above most is that he likes to play it open. He is not interested in getting bogged down in the pummel, nor is he hoping to breathlessly work his way towards passivity calls. Sancho is confident he can fight through to the body, so he constantly adjusts his position and approach to do just that. Now that he is firmly entrenched as a perennial threat, the next step is in reach more than it ever was before. Coleman and Sancho are much more similar than they are different. When Coleman is clicking on all cylinders, there are very few who can withstand the type of offense that resides in his vast arsenal. Throws, darting bodylocks, throw-by’s…he can wrangle these things from seemingly out of nowhere. Sancho is about that life, as well. The one area where the two veer off is Sancho will pain himself to find inside looks he could do something with while Coleman is more apt to sit back and wait for his chance to exploit openings. Given the current-but-supposedly-changing ruleset, any match between these two where the action takes place mainly on the feet is destined to deliver high drama. Another wrestler who understands how to operate under the glow of the spotlight. Thielke’s 2016 was one of those years that will be remembered for a long, long time. The 2013 World Team member at 60 kilograms saw his career taken off the rails momentarily while in school at Wisconsin. Once he re-dedicated himself to full-time Greco-Roman competition, the results speak for themselves. Thielke earned his Olympic Trials coronation not just by winning, but by dominating the field and as good as everyone knew he was, no one expected it to go down quite that way. He didn’t punch his ticket to Rio at the 1st World Qualifier but he sure did his next time out. At the 2nd OG Qualifier in Istanbul, Thielke defeated two prior Olympic medalists during his four-match rampage to make the finals, where he was ultimately subdued by Iranian legend Hamid Soryan. Still, it was an incredible performance. Thielke went 1-1 at the Rio Olympics and after that, required surgery on his labrum. He spent the next few months rehabbing before getting back in gear for the Dave Schultz Memorial in early February. Plain and simple, he did not look like himself out there. 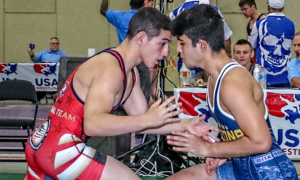 A first round tech fall win over Roger Stewart (NYAC) gave way to a dreary 5-2 loss to Egyptian Mostafa Mohamed. In his first consolation bout, WCAP’s Mike Fueffinger threw him and pinned him. It would be ridiculous to take anything of note from Thielke’s disappointing Schultz showing. It was his first time back following surgery, and it is foolhardy to read too much into an athlete’s return from injury, especially if it was a downer. Also, maybe the grind to make 59 became too much. These aren’t excuses. He didn’t perform well and that is all you need to know. 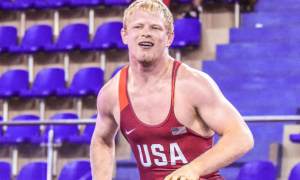 But if an athlete with the credentials and talent that Thielke holds decides to move up for a World Team Trials, chances are it is because he knows he has a shot at that weight. A very, very good shot. A healthy, vital Thielke should be considered a legitimate favorite just as Coleman and Sancho are, and you can bet the rest of this bracket acknowledges that fact. 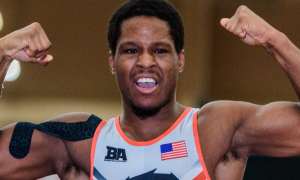 Brian Graham (Minnesota Storm) The 2015 National Teamer left the sport last year but is now back for the World Team Trials. That is a good thing. Graham, 28, brings several problems to the table for opponents. For starters, he is an all-around wrestler who can scramble. He is also a bear in the tie-ups and if an opponent hangs their head, even for an instant, he’ll be in on it. Should the action move to the mat, Graham owns a pretty lethal gutwrench but has also went to lifts when his lock isn’t compromised. The key will be watching what Graham does with this rule-set and how he adjusts to the pace. He brings pressure, for sure. Will there be rust? Probably. It’s only natural. But if Graham can get comfortable and fall back into his rhythm, there is really no reason why him putting a scare into some people should be so hard to imagine. Rudy Guillen (University of Mary) An involved athlete at the age-group level, Guillen is just starting to enter into the foray of elite Senior competition. He is apparently serious about his objective, too. After surprising with a bronze at Schultz (defeating another athlete on this list for third, Jessy Williams — in fact, Guillen beat Williams twice handily at the event), he then went over to the Hungarian Grand Prix. He lost in his only bout there, but the one thing you saw was that the longer the match went on, the more Guillen began to flow with the action. There is still some seasoning required and a few technical refinements are probably necessary, but other than that, Guillen looks like the real deal. There are several fascinating potential match-ups he might be a part of and win or lose, they’re going to help him kickstart his career even more. Austin Morrow (NYAC-OTS) Morrow is progressing nicely as his career begins to heat up. In 2016, the NMU wrestler won the University Nationals, placed second at Sweden’s Malar Cupen and then was a runner-up again in New York at the Bill Farrell Memorial. A big opportunity for Morrow arrived soon after, as he was selected to the US squad for the World Wrestling Clubs Cup. Things didn’t go so well over there — his only win was a forfeit and he dislocated his shoulder. He has worked extremely hard to heal it up to where the surgery that was once recommended has been taken off the table for now. Morrow is one tough dude who can use his long arms to collect bodylocks and turns. He also never wilts. Maybe Morrow isn’t expected to win this one just yet, but you’re likely looking at a future contender for years to come. 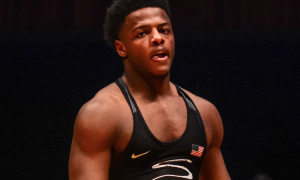 Sahid Kargbo (Patriot Elite) Another former University World Team member, Kargbo was last spied at the 2016 University Duals that took place at his college, George Mason University. He’s back in the thick of things now, which is super. Kargbo does not mess around on the mat. He’s after underhooks and can dig while lowering his level. This opens up all sorts of opportunities for him to get inside. Once there, it’s showtime. The main hangup with Kargbo is that he isn’t involved in a full slate of Senior competitions, so it is tough to determine what upgrades have been made to his game and also, how he will deal with what is likely the deepest tournament he has ever been in. But the kid is a talent, therefore, taking him lightly could prove to be a big mistake. 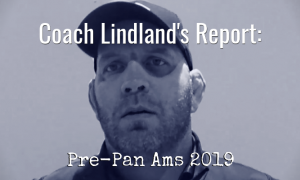 Jessy Williams (NYAC-OTS) Outside of a one-sided loss to Coleman at the Nationals in December, Williams showed the kind of poise and toughness that will be his calling card going forward. When it comes to raw power, there aren’t a whole lot of guys here who can hang with him, but the positioning has to be there first. If Williams commits to staying upright and chest-to-chest, he will likely find that much of the offense he searches for is right in front of him. Williams has gotten some mat time lately. Last time out was the Schultz and a second-consecutive fourth-place finish. We’ll see what he has in Vegas. Like his teammate Morrow, Williams is someone who keeps coming closer and closer, but the top level may have to wait just a little longer.